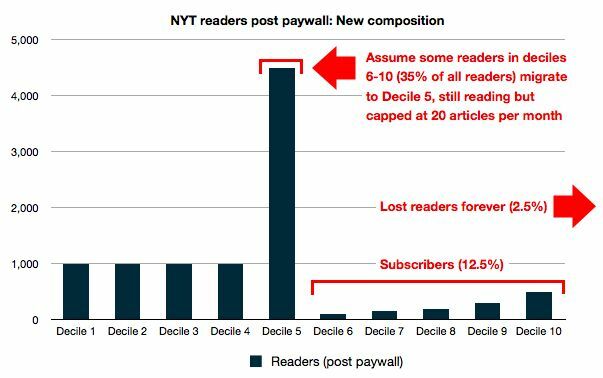 As newspapers face plummeting circulations and an audience reluctant to pay for any online content, erecting a paywall is risky business. The New York Times announced just such a wall this week — a careful gambit in which it will continue to give readers 20 free articles a month (or more if you land from Google search), but for the 21st article on you must subscribe at $15 per month for web and phone access, $20 for tablets, or $35 for all combined gizmos. The question on everyone’s mind is: Will NYT get creamed by fleeing readers? Curious, we modeled scenarios for how the Times might actually profit without killing itself. These are guesses of course, but let’s play the game through. Step 1: Take 10,000 NYT online readers and divide into 10 equal deciles. Here’s what a sample portion of the Times’ audience looks like, with 10,000 readers apportioned to 10 equal groups of 1,000 (deciles). 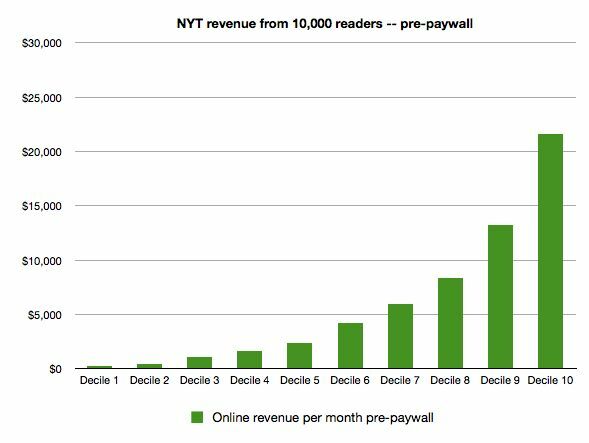 For each step in the following analysis, we’ll track the movement of readers and revenue from the starting point of these first 10 deciles. Step 2: Estimate how many articles each group reads. The Times keeps its online readers’ behavior a trade secret, of course, but we know that within the 10 customer deciles, some are light readers and others are ravenous for news. Let’s assume that the bottom half (deciles 1-5) read fewer than 20 articles a month, and the top half (deciles 6-10) read more, with each tier having heavier usage. We’ve estimated the most ardent readers of the Times read 180 articles a month, or about 6 pieces per day. So far, so good. Step 3: Estimate the current online ad revenue. We know The New York Times charges about $15 to $20 CPM (cost per thousand impressions) for ads. 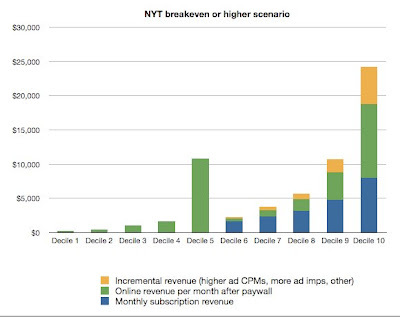 Assuming it can average $15 CPM (on the conservative end, since ad networks often allow buys in the Times for CPMs below $5), that’s $15 per thousand ads served — or 1.5 cents per single ad presented to each reader. Let’s also assume each article carries only 8 ads, 4 per page on 2 average pages. So at 12 cents in ad revenue per article, and our guess above on how many articles readers access, we can model the total revenue from 10,000 readers. Higher reader tiers with heavier usage obviously generate more ad revenue. 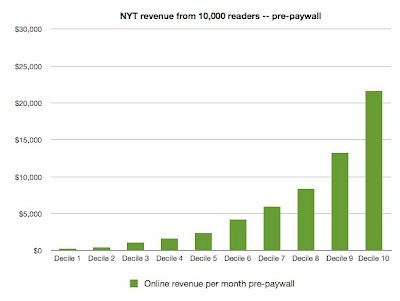 Average estimated online revenue per reader per month in this scenario is $5.93. Whoa! Only $5.93 per reader per month? You can see why the Times is interested in making money from online subscription fees. Next, let’s forecast what happens to this merry reading crew once the paywall goes up. 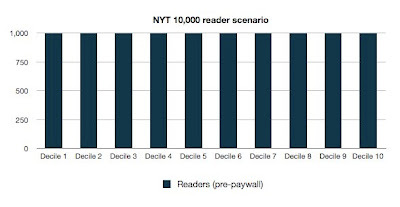 Step 4: Estimate the audience shift after paywall. WHAT? YOU WANT US TO PAY?! Now, no one knows how the audience will respond, but the Times has been clever. Half the readers won’t feel any pain at all. Everyone gets 20 articles a month for free, and the paywall only looms for the most fervent fans of NYT’s coverage, most likely to be forgiving. So let’s assume true losses — customers ticked off enough to leave the Times forever — are minimal at about 5% of the readers in the top half of usage deciles. So the Times overall would lose only 2.5% of all readers for good. 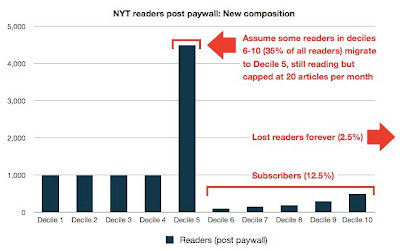 Let’s then assume that about 25% of the high-reader groups, or 12.5% of all online readers, subscribe, and the remainder “shift” to tier 5, the group that caps out at 20 articles a month unwilling to pay for more. The resulting readership composition looks like the bars above. The subscription fees will hit only deciles 6-10, readers above 20 articles. If we guess the average fee is $16 per month, we can add subscription fee totals to the remaining ad revenue. Yep. The Times makes less money, with average revenue per reader falling in our estimate from $5.93 per month to $5.34 — a 9.9% decline. The New York Times isn’t stupid, of course, and has had McKinsey-level MBAs crunching numbers to see how it can make more money from its readers while not damaging the ad revenue. 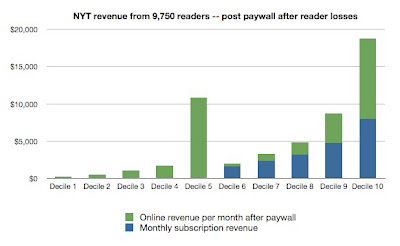 Readers who sign up for paid subscriptions have huge value — they’re more loyal, less likely to leave, provide more information about their demographics, and most important give the Times opportunities to charge advertisers more for access. And that’s the key. 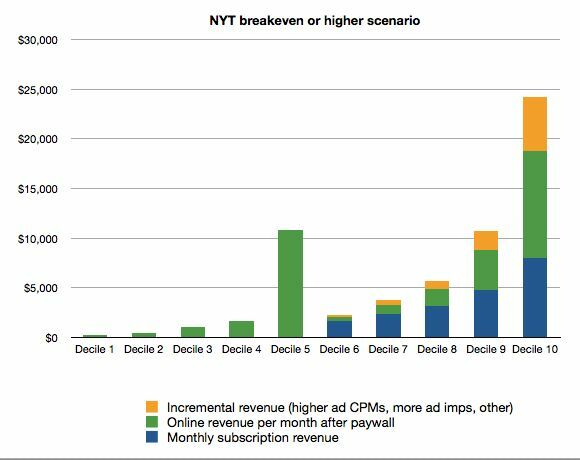 If we assume the Times pushes its pricing a bit for this new subscriber base — say, upping CPMs on online ads, or charging more for tablet and mobile advertising that has heaviest usage among the top readers — it could surpass the pre-paywall revenue levels. The table above shows this scenario, with a 50% push on ad rates only among subscribers resulting in average revenue per all readers rising from $5.93 pre-paywall to $6.25 post-wall — a 5.4% gain. In addition, the new subscriber model may lower future reader loss rates, since it’s hard to leave once you pay. It is possible for the Times to come out ahead with more money from fewer readers. Like an airline, NYT is charging only its best customers higher rates, and the love from that audience may ameliorate the bitter pill. And the beauty of the Time’s partial-payment model is it should scare customers into defection slowly. If readers begin fleeing in droves, the Times can always tear that paywall down.